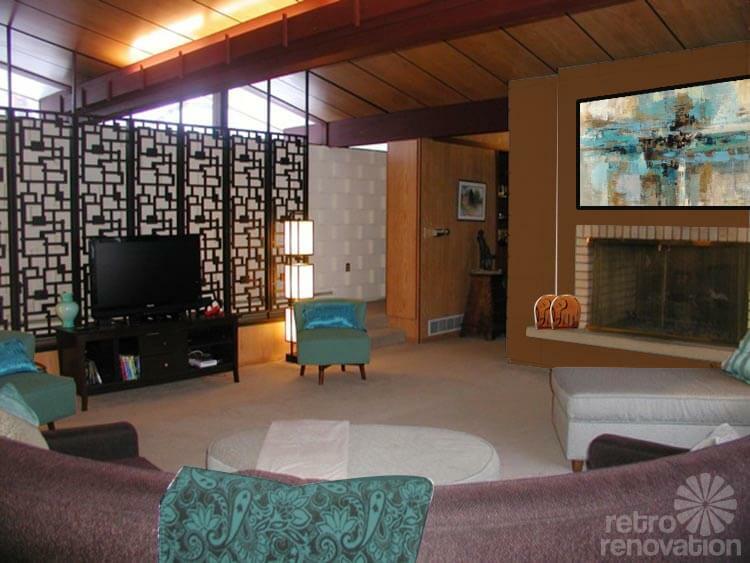 Reader Kathy has an impressive mid-century modern house with oodles of amazing original features including a biomorphic wall screen, mahogany wall panels and clerestory windows. However, There is one feature that has been bothering her since the day she first moved in. 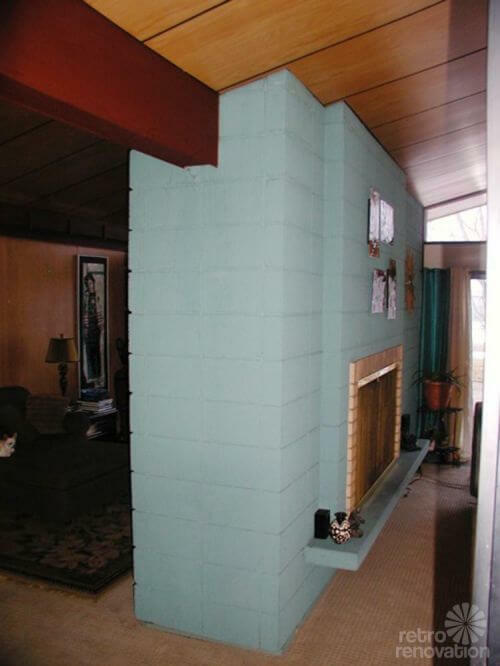 The paint color of the large concrete block fireplace — she calls it “the big blue monster — is not jiving with the rest of her home’s decor. Now Kathy has asked for our help with ideas to tame this turquoise tyrant. A good friend told me many years ago to live in your house for a while, and let it tell you what it needs. I have lived with it for nearly a year, and the same thing is bothering today as it did the day I first saw it. The big blue monster. My design dilemma is my fireplace wall. 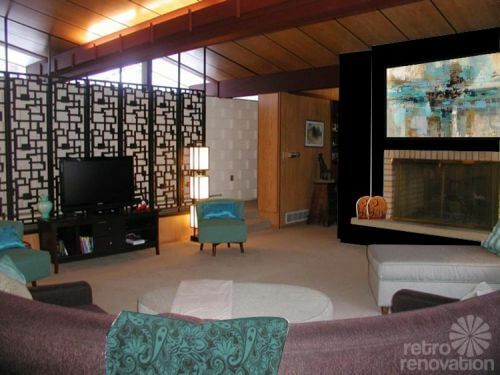 It is a double-sided fireplace in the living room and den. It is painted turquoise block and is in need of new paint or something different. It is the focal wall in the living room. The part I don’t like is the contrast of the blonde brick that matches nothing else. There is blonde paneling on the short walls and the ceiling. Another block wall in the room is more interesting, with concrete caps placed between the blocks, and it is painted cream color. 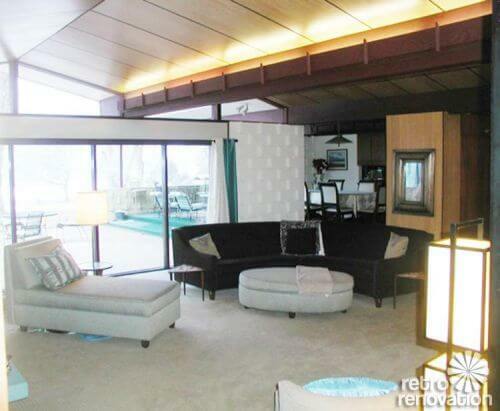 There is also an eight-panel helix patterned wood screen and a wall of glass overlooking the patio. All other rooms in the house have mahogany panels and doors. I feel this accent is lacking in the living room. The fireplace wall is 15′ long x 9′ high, and the opening is 55″ wide x 33″ high. 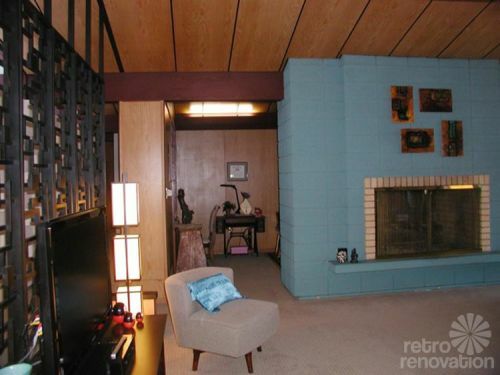 My idea is to somehow incorporate mahogany either in shelves or panels and paint the block to more closely match the original double oven which is more blue green than the fireplace. The hearth may also look good clad in mahogany. Not sure how to blend the block and brick. This is what people see when they stand in my entry and I feel it is not as attractive as other details in the room. Please help me tame the monster. 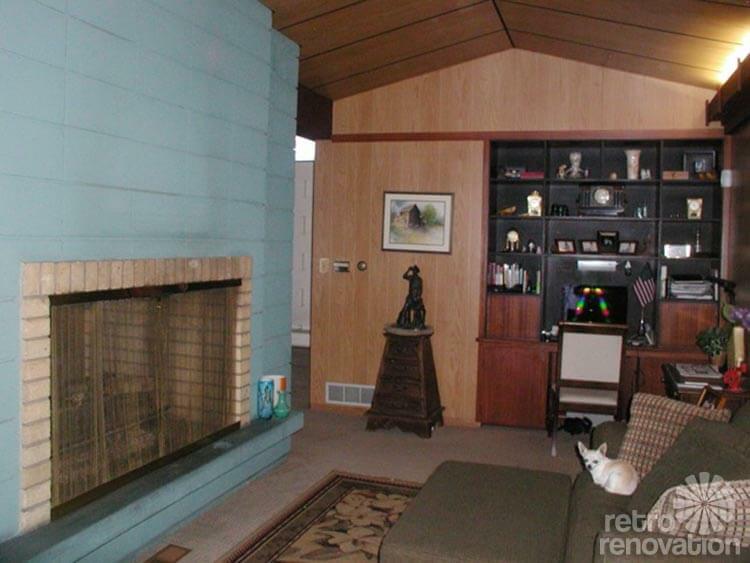 Readers — What paint colors or other design ideas would you suggest to make this fireplace fit in with the rest of the room? As you can see from the Before & Afters above, we believe that in this room, the key to success may be: Harmonizing the color of Big Blue — paint it the same color as the other concrete blocks on the wall visible, above. There are already many finishes in Kathy’s room: Light mahogany wood, dark mahogany wood, cream cinder block walls, black decorative screen, beige carpet, tan fireplace brick and blue fireplace block. They are all very pretty. But, hmmmm, adding yet another color to the mix — that blue — is giving us finish overload — our eyes don’t know where to rest. The architecture of the room is very graphic, and the space, very open. Any finishes you choose, or accents you add, must work within this graphic framework. All of the existing finishes are warm and organic feeling. The blue of the fireplace is really the only “cool” color in the space. Because of this, and because it takes up such a large area, it makes it stick out and feel out of place. To solve for the issue: Simply paint the fireplace the same cream color as that back wall. 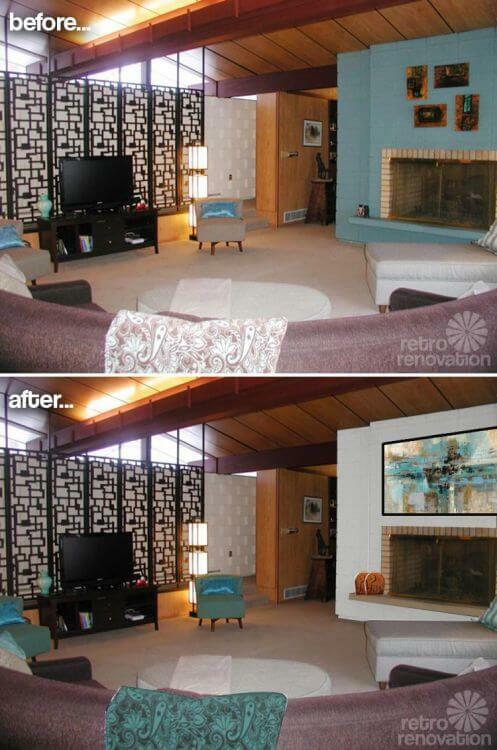 Kathy can then use her desired accent color — a turquoise blue — in furnishings and accessories throughout the room. In fact, the color “pops” quite nicely … artistically … graphically … once you harmonize that big block fireplace. Kathy’s idea of possibly covering some part of the fireplace with mahogany was also on the right track, we thought, since that would repeat the mahogany and help make the fireplace feel connected to the rest of the space. However, Pam and I both agree that there is already quite a bit of wood in the space — walls, beams, ceiling — and think the best — and surely, a way easier — bet would be to repaint the fireplace the same cream color as the other cinder block walls. This also will prevent the room from feeling too heavy with all of that wood. 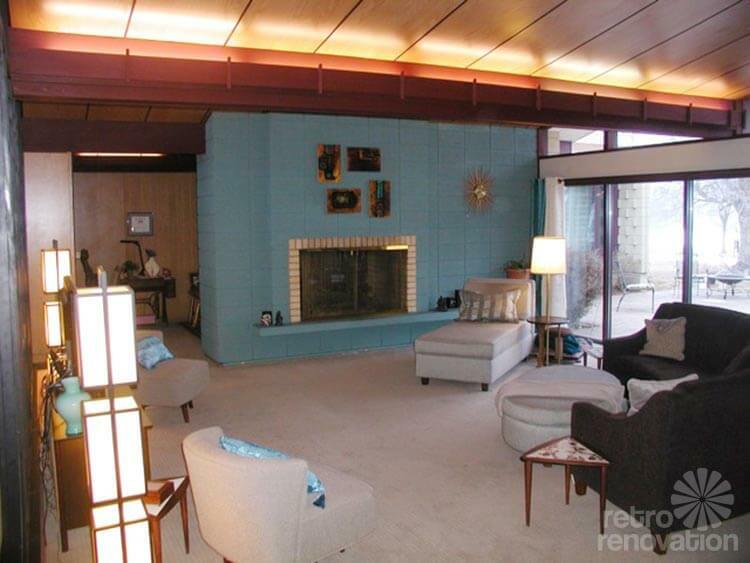 In the mock up above, you’ll notice that we didn’t paint the cream colored bricks around the fireplace opening. We think that instead of painting the bricks, leaving them natural and then paint the ledge the same color as the brick. This will help make the area feel more grounded and part of the whole design. In general, we also like to avoid painting original brick. Above: We tried painting the bricks that immediately surround the fireplace opening and the hearth ledge, too. We do not like this look as much as our ‘keep these natural’ board. 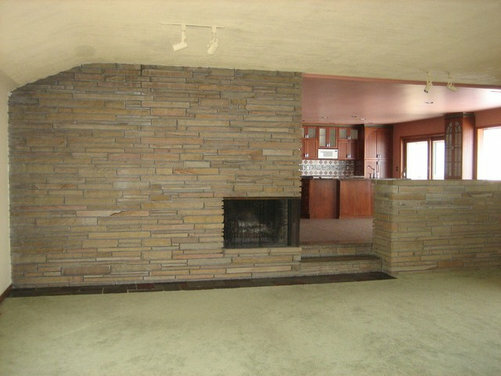 Too … stark .. we like the warmness of the beige brick and ledge. Painting the fireplace black certainly is graphical. 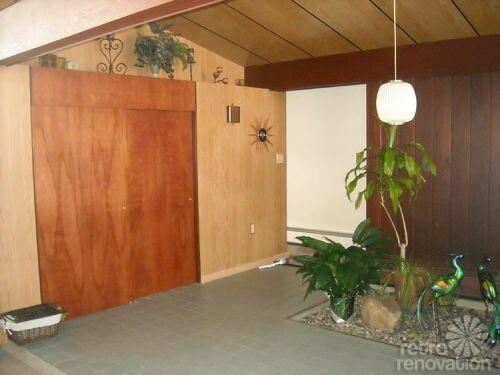 But, we think this makes the room too dark… also, it is yet another color on another surface [black on concrete]. 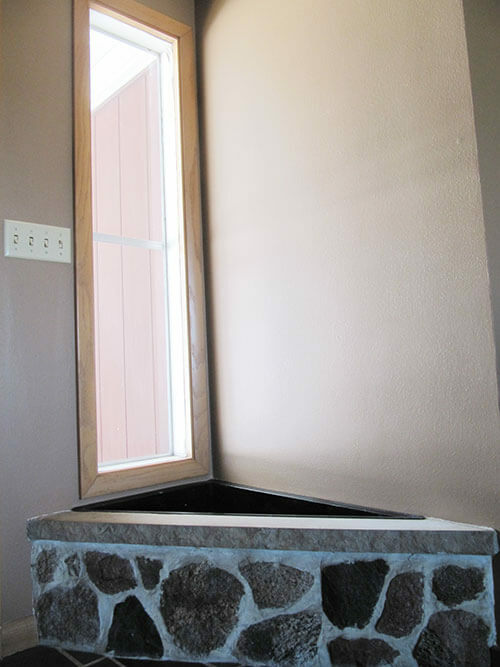 Paint the fireplace wall a color similar to one of the woodtones. Certainly harmonizes with the woodtones elsewhere in the room — but Kate and I remain concerned that adding yet another color-on-another-surface is just too much. Pam wanted to note that when selecting paint for the fireplace, it is important to pick the very best quality paint that you can afford. You will also want a finish that is easy to clean. When painting, also ensure that the surface is prepped and paint applied using the best quality products and practices available — the surface of that fireplace is such an important element in the room, you want that paint and finish to be absolutely delicious. Good paint really can make a difference! 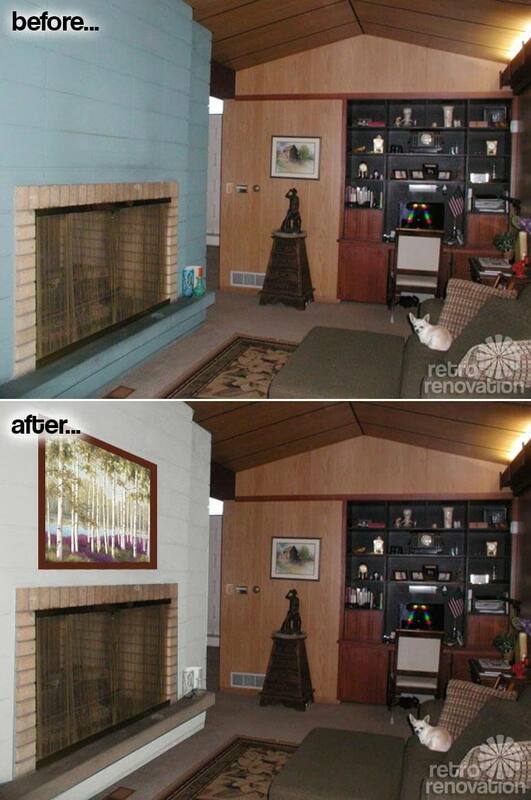 This will help prevent headaches down the road — painting a fireplace is a big job. Pam suggests checking Consumer Reports for the paint quality testing. You will need to subscribe, but she thinks it could be worth it. 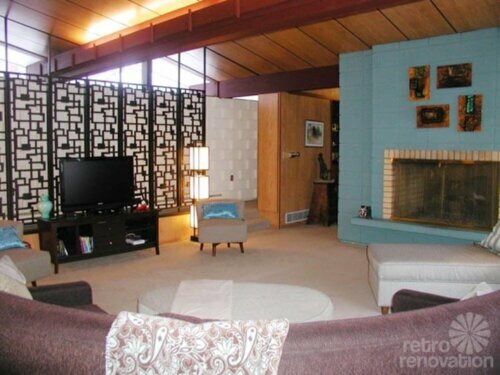 Reupholster or replace the chairs flanking the TV and choosing a rich teal fabric. The room itself — walls, ceilings, flooring — needs to stay neutral to look cohesive. Add color in the furniture and accessories. Add the accent color in other accessories — such as in pillows, throws and artwork. 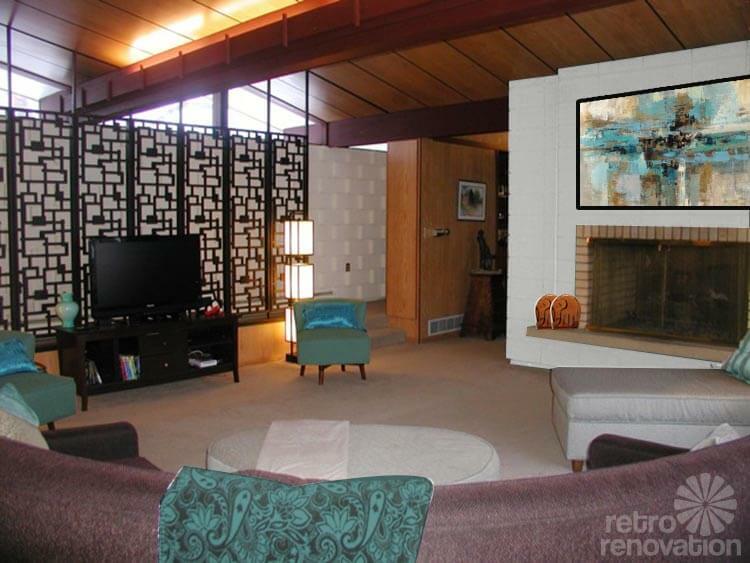 Instead of having several small pieces of art on the fireplace, try one large painting or print. The art we used is a print called “Morning Fjord” available at Art.com, which picks up all of the colors in the room while the black frame mimics the room divider. Try not to have too many small accessories scattered around the space. The scale and style of this room dictate fewer, larger accessories. Instead, move the smaller accessories in the main living room to the built in shelf in the den, or make a colorful tablescapes that group items together. See our story about David Hicks and the art of designing tablescapes. Think of the design of this room as a piece of modern art. The lines, textures and shapes speak for themselves without needing much additional decoration. The huge expanses of windows frame the “art” that is the world outside and work to bring the outside in. We agreed that the same treatment should be applied to the opposite side of the fireplace in the den. 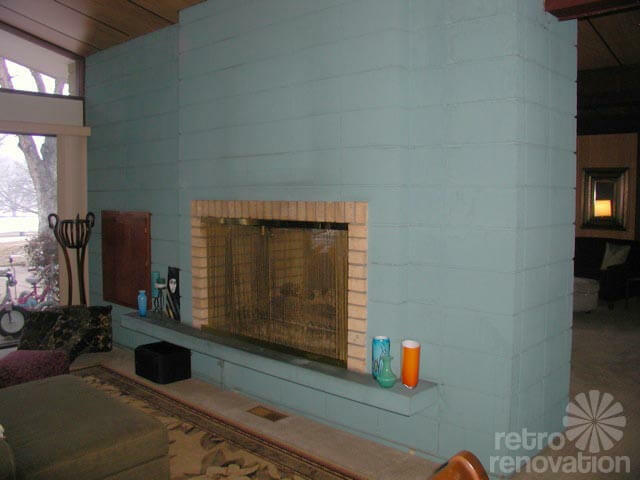 Again, the fireplace is painted to be the same cream as the home’s other cinder block walls, leaving the beige brick and painting the ledge to match. Another framed print from Art.com — entitled “Plumb Forest Floor” — hangs above the fireplace in a mahogany frame that echoes the built-in shelving. Have lots of fun using that terrific built-in shelving to make art-scapes with your smaller collectibles! When it comes to adding small pieces to the living room, sometimes a collection of similar small objects can read as a part of the bigger picture. And minimilist mid-century modern can get… ascetic feeling — we we believe in not taking it all too seriously and being sure to add some whimsy. 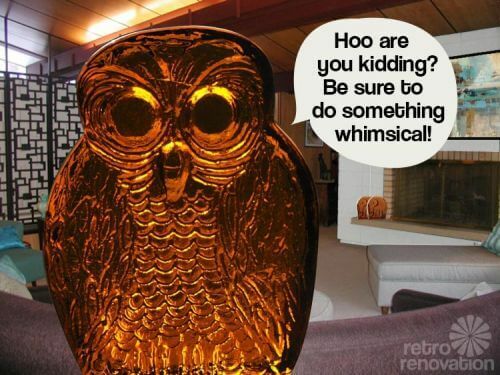 Here we’ve illustrated that point by going a bit overboard on the scale of this Blenko Amber Glass Owl bookend from Etsy seller MoonshineAntiqueShop. We also liked these fun vintage Amber Glass Blenko Elephant bookends from Etsy seller ShootingCreek. And how about these Blenko Owl Amber Glass bookends from Etsy seller junk2funkbiz and a great Blenko Amber Glass lamp from Etsy seller HostaHillFarm. We like that these bookends are silly. We like that they are from a famous mid-century glassmaker. And we like their color — the amber glass works well in the space because its warm feel echoes the warmth of the wood, and the color contrasts nicely with the aqua, too found in the room. These Blenko pieces can get expensive – but put them on your birthday and holiday lists and in a few years, we guarantee you’ll have a collection! I know I may get stoned for saying this but I don’t think the color is such a bad thing – it’s just a c*** color it should either be softer or richer. I like the idea of using the oven color. It’s so rich and deep. But then I love color. I think part of the problem with the paint on your fireplace is that that looks like it’s flat paint – which just plain gives me the hebbie jebbies on stone. When you get the paint tell them it’s for a fireplace and they’ll give you masonry paint which has a little sheen and that will help. I also think resurfacing it with a stone kit. They have lots of them out there. I ‘ve seen it done and they look great – a friend of mine did a slate strip on her’s and it looks fab! A red or burnt orange color I think would look best. It would mingle well with all the natural tones in the house. 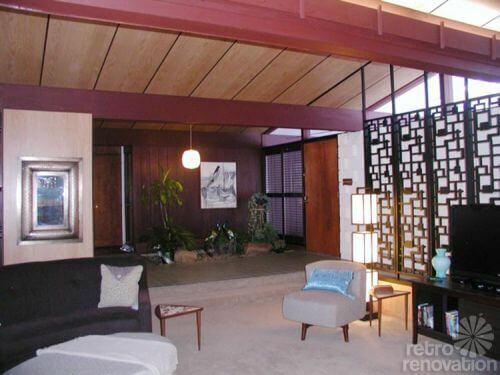 Are the crossbeams on the ceiling painted burgundy? If yes, I think I’d paint to match the crossbeams. I believe the beams are a different, redder stain. That same stain continues on to some of the trim in the adjacent area on the other side of the fireplace. Lots of MCM goodness going on in your house. Shame that someone decided to paint over the original natural block walls that were probably a natural color. Easiest and most economical fix would probably be a light neutral paint color that harmonizes with the existing wood finishes or match the color of the other cream color block wall for continuity. 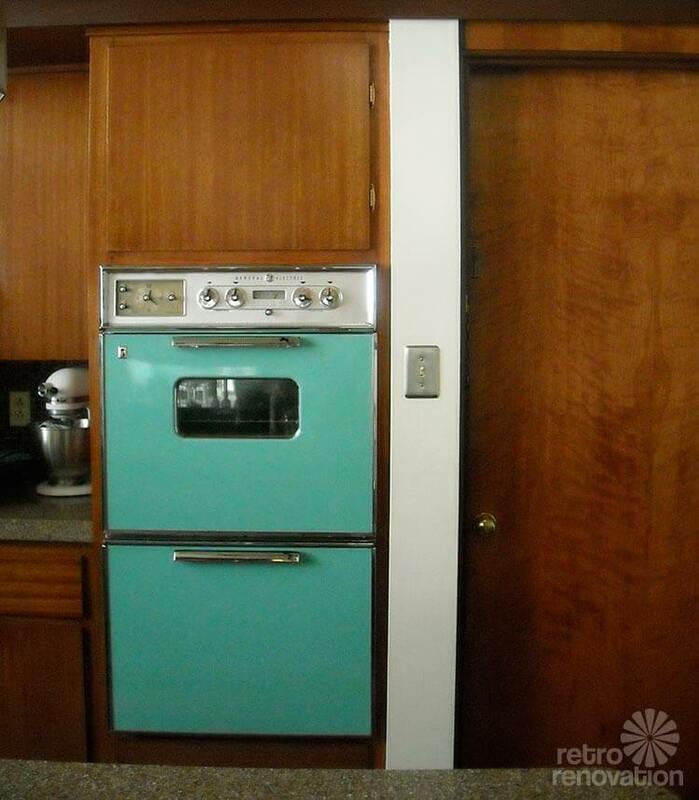 I think matching your oven color will be more of the same. If the budget allows and you are considering refacing make sure you hire a pro who has experience with anchoring new stone/brick walls to existing FP masonry, you don’t want the new material to tumble down. I think I would prefer to see the original block retained and just repainted as it’s an original house feature. Wow, your house is to die for….. I would re-face the brick with wide stacked stone. It needs to be natural. Here’s an example.